Croquet is a favorite family game with a very friendly design. 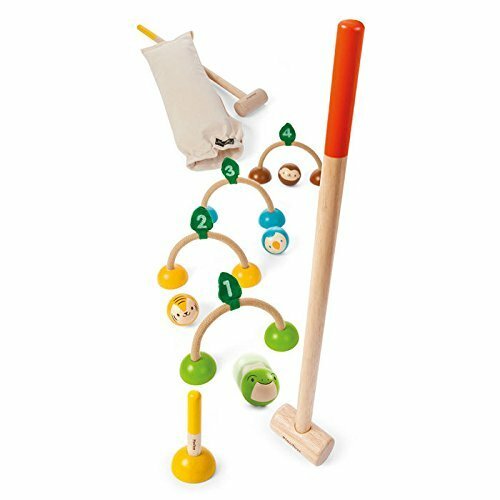 The colorful Croquet set can be played in several adjustable settings. The set includes 4 different animal wooden balls - bird, tiger, monkey and frog, 2 mallets, 4 wickets and a final stand. Bag included. For more than 30 years, PlanToys has been consistently developing its products and activities with a strong commitment to contribute positively to the world. By implementing best practices and taking innovation of toy-making and design to the next level, PlanToys is not only known as being the first company to manufacture wooden toys from preservative-free rubber wood, we are a leading company that has created a new material and process as part of our zero waste goals. Continuing our commitment for a sustainable future, PlanToys has introduced PlanWood as another high quality, safe, and sustainable material in our toy-making process. This material will be used in harmony with our solid rubber wood. PlanWood is an eco-friendly material because the waste is minimized and fewer trees are reclaimed. The less energy, used to produce PlanWood ultimately reduces our environmental impact. PlanToys values have been rooted from embracing Mother Nature. The company has grown their green values into values of Sustainable Play. Sustainable Play is the foundation of how our toys cultivate creative minds and bring children closer to nature. If you have any questions about this product by PlanToys, contact us by completing and submitting the form below. If you are looking for a specif part number, please include it with your message.